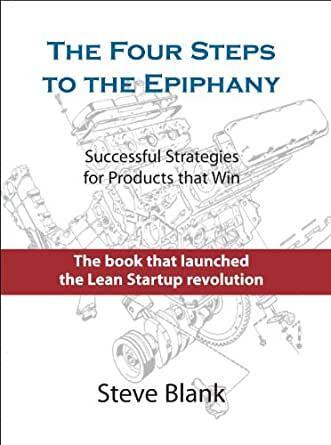 The bestselling classic that launched 10,000 startups and new corporate ventures - The Four Steps to the Epiphany is one of the most influential and practical business books of all time. The Four Steps to the Epiphany launched the Lean Startup approach to new ventures. It was the first book to offer that startups are not smaller versions of large companies and that new ventures are different than existing ones. Startups search for business models while existing companies execute them. Packed with concrete examples of what to do, how to do it and when to do it, the book will leave you with new skills to organize sales, marketing and your business for success. If your organization is starting a new venture, and you're thinking how to successfully organize sales, marketing and business development you need The Four Steps to the Epiphany. Essential reading for anyone starting something new. This book does an an excellent job of explaining why running a startup is different from running a large company. The Customer Development approach is the core message of this book. Startup's journey commences with identifying a problem and it's success heavily relies on executing Customer Discovery and Validation steps. I highly recommend this book to anyone in the startup business or looking to build one. The book has a distinctive flavor of vc-funded enterprise software startups. The model of having enough money to have separate product and customer development teams before you've written a single line of code may exist in some imaginary world but not in the tech world of 2017. The book was written before Github, stackoverflow, anything as a service and the entire gig economy. If you need to go to trade shows to know what your customers need you are in the wrong business. His insights on vc mistakes and misfitting VP sales to innovative startups are true although observations of marginal value to the reader. Despite these flaws the last chapter on company building is a valuable contribution to beginning entrepreneurs, if they are capable of absorbing change, taking advice and have the good fortune to have the right role models and coaches. As a serial entrepreneur in transition to mission oriented company in my fifth startup clearclinica.com I found the last chapter a well built and thoughtful roadmap for change. 4.0 out of 5 starsEmpty your "Product development" cup to fill it with "Costumer development" instead. I loved the fact that the Kindle edition had the link to youtube videos and other e-material. the first half of the book is addictive, really a cool new vision on product(costumer) Development. The second half of the book felt more like a field-book, which in nice but without the actual context is a little bit harder to keep reading as a whole publication. Notice that this is the intent of the author. I got to this book from "The Lean Startup", you can think about this two books as "complementary"
4.0 out of 5 starsNovel and methodical approach to startups! The book is good and interesting. Steve gets all his experience on the table, and makes a wonderful case for "Customer development" and "Product development" going in parallel. I have been through a launch of a product, and much of what he mentions in the book have also been my reasons for failure - and that's truly insightful! Many of the situations in the book has had happened in my case - primarily because we've been majorly "product development"- centric and worked on "customer development" after the product had reached the MVP state - when we figured out that things don't work the way customers like. Also, the examples and case-studies in the book are very nice. Some of them, I can already identify with (Eg: SUN's great start), and many I knew not - but still very apt. Postmortem on failures is a very nice way of explaining way to succeed, and Steve does a good job at it! Some parts of the book becomes a little monotonous to read. I see some repetitions, and some very obscure text. I could actually skip some pages in between, and still get a gist of the chapters. This is the reason for 4/5 stars. This book was recommended to me by a friend when I told them that I had enjoyed reading Lean Startup. He insisted that Four Steps to the Epiphany was far more detailed, instructive and thought out. This is pretty much an iterative recipe book, walking you through steps in detail with specific recommendations to return to earlier steps if milestones aren't achieved. Note: The review that follows is of the Third Edition, published in 2007. In this volume, Steven Gary Blank introduces and then explains in thorough detail the "Customer Development" model, one that he characterizes as "a paradox because it is followed by successful startups, yet has been articulated by no one [other than Blank, prior to its initial publication in 2005]. Its basic propositions are the antithesis of common wisdom yet they are followed by those who achieve success. It is the path that is hidden in plain sight." In fact, Blank insists that what he offers is a "better way to manage startups. Those that survive the first few tough years "do not follow the traditional product-centric launch model espoused by product managers of the venture capital community." And this is also true of product launches in new divisions inside larger corporations or in the "canonical" garages. Moreover, "through trial and error, hiring and firing, successful [whatever their nature and origin] all invent a parallel process to Product Development. In particular, the winners invent and live by a process of customer learning and discovery. I call this process `Customer Development,' a sibling to `Product Development,' and each and every startup that succeeds recapitulates it, knowingly or not." Wow! This really is interesting stuff and I haven't even begun to read the first chapter. Few start ups succeed, most don't, and Blank notes that each new company or new product startup involves (borrowing from Joseph Campbell) a "hero's journey" that begins with an almost "mythological vision - a hope of what could be, with a goal few others can see. It is this bright and burning vision that differentiates the entrepreneur from big company CEOs and startups from existing businesses." Although Blank suggests that the aforementioned "journey" involves a four-step process, it should be noted that not one but several epiphanies or at least revelations can and - hopefully - will occur during that process, one that is multi-dimensional rather than linear, from Point A to Point Z. No brief commentary such as mine can possibly do full justice to the scope and depth of material that Steven Gary Blank provides in this volume but I hope that I have at least suggested why I think so highly of him and his work. Also, I hope that those who read this commentary will be better prepared to determine whether or not they wish to read it and, in that event, will have at least some idea of how the information, insights, and wisdom could perhaps be of substantial benefit to them and to their own organization.